Nancy Lukoskie’s passion for the heritage of stitching, ecclesiastical needlepoint design, and finishing began when she was just 19. More than 38 years later, Nancy and her team at Fancywork Finishing have brought beauty and joy to many spiritual communities including the Washington National Cathedral in Washington D.C., Trinity Church Manhattan in New York City, and the Cathedral of St. John the Baptist in Savannah. Nancy Lukoskie repairing a needlepoint hanging at the Washington National Cathedral. In 1984, Nancy became licensed and launched Fancywork Finishing to support church communities with their needlepoint projects. Her team of artisans design, paint, finish, and restore needlepoint artwork for clients based upon their ecclesiastic traditions, unique history, and spiritual symbolism. 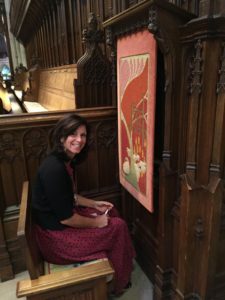 Due to her depth of experience and passion for the craft, she is also an instrumental member of the Washington National Cathedral’s Altar Guild and Preservation Committee. Nancy’s ministry is to bring life to liturgical needlepoint and “no project is too big or too small.” She will help your church pursue and create needlepoint art to enhance the beauty within your church walls. She also helps everyday needlepoint enthusiasts by offering workshops fit for any skill level to design, stitch, and finish their artwork. St. Mark’s Church, Mitchellville, Md.